Welcome to the home of Central West Citizens! The Town of Chapel has completed a year-long planning process for Central West — see area map . On November 26, the Town Council adopted the Steering Committee’s Proposed Small Area Plan and incorporated into the plan important revisions and conditions proposed by the Planning Board. Key conditions include committing to a town-wide modeling analysis of the cumulative traffic impacts from the proposed development in all of the Focus Areas, and conducting a watershed stormwater impact analysis of the potential cumulative stormwater volume impacts. According to the Council discussion, (click here for videotape) the Small Area Plan density recommendations would be adjusted upon completion of the traffic studies. Read this Commentary to see what was achieved or see the Chapel Hill News story. The final resolution language is here. See our new page about Ephesus – Fordham developments. Today February 6th we received from the Town Clerk of Chapel Hill the language for the final resolutions adopted for Central West Small Area Plan on November 27, 2013. While the Alternate Citizens’ Plan received wide spread support from community members over the last five months, only four members of the Steering Committee endorsed it. However, over the last few months the two plans grew closer together. Several notable differences remained which are summarized in a table here. See the support the Alternate Citizens’ Plan received in one short week. Click here. The Alternate Plan map would bring half as many new auto trips as the Committee plan. In comparison, the Council adopted plan will bring an additional 7000 auto trips to the already crowded Estes Drive/Martin Luther King Jr. Blvd intersection. The Alternate Plan also provided 42% affordable and workforce housing (versus 15%), and a modest positive economic benefit for the Town (versus a net deficit). Another topic of great interest to the Council has been the Town’s fiscal analysis of the Central West small area plan which turned out to show little positive net revenue for the Town when cost and revenues are compared. Council Member Gene Pease was surprised by these results and said: “if we are not making any money for the town, then why are we doing this?”. See our Memorandum with attachments about the Town’s flawed fiscal analysis that were presented to the Council. For historical information explore the Town’s Central West Steering Committee activity webpage here or the Town’s community input page. On Jan 27, the Town Council voted to approve Synthetic Tax Increment Financing which will use the Town Hall building as collateral for the Ephesus – Fordham infrastructure improvement installment loan. The Town procedurally can now pay consultants to do the planning and projected stormwater and road improvements by borrowing against the Town Hall asset. The Ephesus – Fordham infrastructure improvement plan is currently estimated to cost $10 million. It’s a concern to us that the Town is borrowing against an asset (Town Hall) other than for the one being financed. The Town expresses confidence in this troubled economic period that new office and retail revenues from Ephesus – Fordham would pay for it all. Yet Budget Director’s Ken Penoyer’s memo looks only at the projected revenues of the project, and ignores the cost of providing Town services to the properties proposed to be redeveloped; these services include police, fire, road maintenance, transit, and on and on. Since the new taxes from the redeveloped properties must be dedicated to paying back the installment type loan that pays for the infrastructure improvements, the shortfall caused by paying for Town services for the large new buildings would need to come from the Town’s taxpayers. In addition, we note the costs of the needed infrastructure has escalated from $6 million initially to $10 million now and could end up to be twice that. The recently commissioned Town stormwater study estimates a 6 million dollar cost, versus the $1.8 price tag allocated for these improvements as part of the $10 million infrastructure plan. What will the road improvements really cost when construction bids are received? When was the last time the cost of a preliminary road construction plan came in above the actual road construction project cost? The Town-commissioned stormwater study estimates a $6 million cost, versus a $1.8 million price tag for improvements that we think will be difficult to achieve in a flood plain. Planning for growth has been a red hot topic in Chapel Hill this year. The 2020 plan, completed in June 2012, skipped over land-use planning, leaving that critical task to be completed over the next few years in six designated “focus areas” where growth and change are most expected. In the planning world, land-use planning is the civilian equivalent of “boots on the ground,” the sort of planning that affects our community’s health and quality of life most directly. So it’s not surprising that citizen interest is running high. Planning is already underway for potentially large projects near Obey Creek across from Southern Village, and for redevelopment plans along a huge area on Ephesus Church Road and Fordham Boulevard, Glen Lennox, and downtown, where big projects are already going up on Franklin and Rosemary. Following the adoption of the 2020 Comprehensive Plan, the first plan up for a council decision was Central West, a much smaller land area along Estes Drive, just east of Martin Luther King Jr. Boulevard. The council named a steering committee to develop a plan for this area, and the result of almost a year’s work was delivered to the council on Nov. 26. The council’s action on this first focus area plan was heartening. The council held a thoughtful and far-ranging discussion that brought the most important issues into clear focus and set a good starting direction to deal with most of them. Council Member Matt Czajkowski concisely framed the growth-management debate by observing that we have four priority public concerns: traffic, town finances, flooding and schools. He pointed out that many growth proposals make all or many of these problems worse! The council tackled these challenges directly. The general direction of their discussion pointed toward knowing where we are going before making commitments. We heard members cite the need for data, analysis and thoughtful review to make sure that development proposals are really beneficial to our community’s future before we make decisions. Traffic: Jim Ward and Ed Harrison pointed out that we must not evaluate traffic for each development proposal or each focus area in isolation. What happens at Central West will affect traffic-clogged Estes Drive, but so will development at Ephesus-Fordham, near the other end of Estes. Ward pushed for a town-wide traffic model that can assess traffic interactions for the whole town. Town planner David Bonk said that this was feasible. Town revenues vs. costs: Many are concerned about how to maintain good services without letting taxes get too high. Here the critical measure is how much new revenue will be brought in by a development proposal, compared to the additional town costs to service the new development. There was consternation when a last-minute town analysis showed that the Central West proposal would not bring in any significant excess revenue. Council member Gene Pease had often raised the fiscal issue and wondered why we would want to burden ourselves with so much more traffic at Central West with no gain for the taxpayers. Pease and Ward advocated for use of an economic model to evaluate development proposals before approval to encourage the approval of projects with a net benefit to the Town so we do not make the tax bills higher. Flooding: Flooding is a more urgent topic now after last summer’s extremely damaging floods that even put part of Town Hall out of operation. Building on the committee’s recommendation to do a stormwater management plan for Central West, the council took broader action. When there is a big impact on a watershed, the council agreed to conduct a watershed-wide stormwater impact analysis of the potential cumulative stormwater impacts on Bolin and Booker Creeks. Schools: Parents are concerned that Chapel Hill-Carrboro schools will have the needed space for their children and will retain their high quality. Just like traffic, we have tended to deal with school capacity on a project by project basis, asking the schools if a given development proposal can be accommodated. Czajkowski urged a comprehensive approach which may show school capacity is exceeded. The question is whether all the development projects (approved to be built, and all those planned for the focus areas) can be handled by the schools at the time they are anticipated to be built. Mayor Kleinschmidt urged the town to continue to work more closely with the schools as they plan for the sites and financing that will be needed to meet our projected growth. Council Member Ed Harrison successfully urged his colleagues to adopt the Planning Board conditions into the Central West plan, which made official many of the positive directions discussed by the council. If the council continues the thoughtful direction set on Nov. 26, Chapel Hill’s future economy and quality of life will be on a sounder footing. We urge the new Town Council to build on this trend. Submitted by David Tuttle, Mickey Jo Sorrell, Firoz Mistry and Julie McClintock. 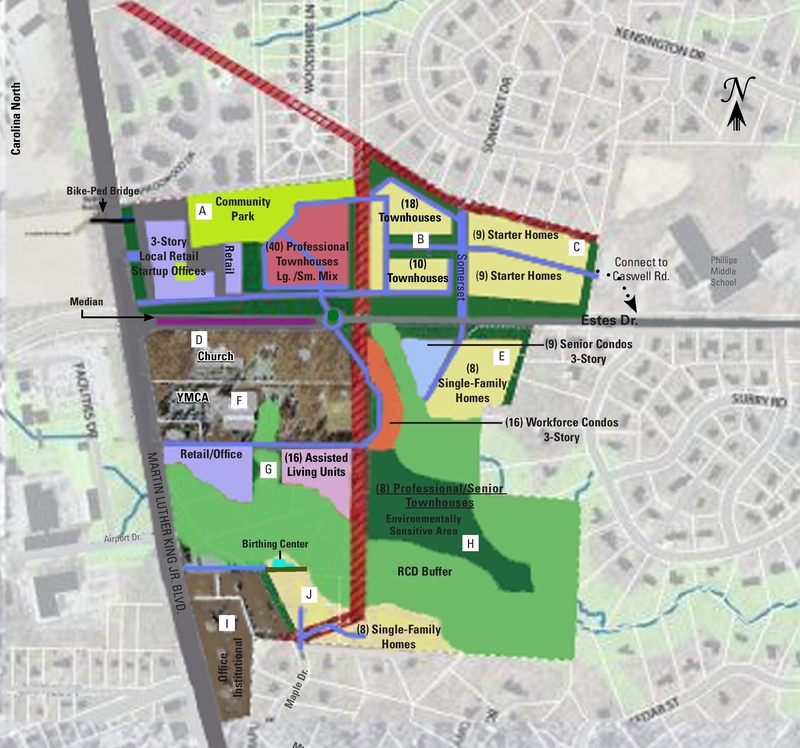 The Chapel Hill Planning Board met on November 19th and responded positively to concerns expressed by the public. The Board adopted these recommendations to the Town Council which we support. We strongly recommed that the Town Council adopt these recommendations as a part of the proposed small area plan. The Chapel Hill Transportation Advisory met October 24th. Michael Parker wore two hats as chair of the Transportation Board and Steering Committee Co chair. After he presented the plan, the Board heard public comment. Three steering committee members spoke in favor of the Citizens’ Plan. Steering Committee member Firoz Mistry asked that Whit Rummel, Central West property owner and member of the Transportation to recuse himself. Mr Rummel voted on the motion with other Board members to adopt the Central West Committee’s higher density Small Area Plan with the caveat that “all means necessary be used to keep traffic moving on Estes.” This caveat was surprising as the Town has made it clear that it does not intend to widen Estes: (1) there is no money to do so allocated at the MPO; (2) the 2009 Long Range Transit Plan does not list Estes as a transit corridor, and (3) CW steering committee itself has voted to keep Estes to two lanes. Transportation Advisory Board Resolution is here. The Chapel Hill Planning Board met on October 29. The Board heard a presentation from the staff and co chairs. A number of citizens spoke in favor of the Citizens’ Plan. In addition these concerns about the committee plan were raised: (1) committee plan densities will cause gridlock on Estes; (2) questioned the traffic consultant’s assumptions about how many people actually will use Estes versus MLK; (3) concern that no real plan for affordable housing exists; (4) uncertainty that a stormwater management plan will be effective at managing substantial increase in impervious surfaces; and (5) a call for respect for the old growth hickory forest on the Davis property. The Greenways Commission met October 23 and made these Recommendations. The Bike and Pedestrian Board met October 22 and made these recommendations.